Poi Dawgs got a great game from Jacky Thong in the championship game Monday evening at Bobby Morris. After Yea Boi turned the ball over to start the game, Poi Dawgs answered with a score and never looked back. 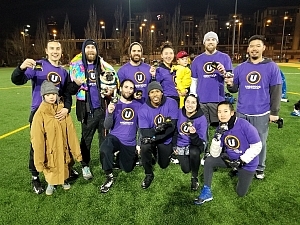 Playing stellar championship football on both sides of the ball, Poi Dawgs played one of the cleanest games you will see in our league as well. Both teams had one early rush penalty combined and that was all for the game. Yea Boi had some opportunities to score and get back in the game but had multiple drives fall short on 4th and goal and Poi Dawgs took full advantage. Great game for both teams and great season for all. Congratulations Poi Dawgs!